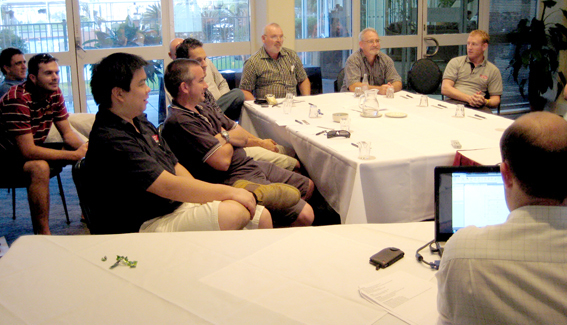 The team at Planit QLD (Internet IT) held their second Business to Business Seminar from the 6th to 8th September 2010. A total of 64 people from as far away as Perth and New Zealand attended the seminar. Not only was it a great time to collaborate with other business people of the same or similar natured industry but some valuable information was also ascertained during this time. The commencement of the 2.5 day event was a nicely relaxed dinner and drinks at which a list of questions was given for each table to discuss. These questions were supplied by customers prior to the event as items of business interest to them that they wished to hear how other people handled these same situations. While the discussions were slow to start, this improved greatly when tables were advised that the bar would be turned off if questions were not being answered. This brought an immediate response and everyone joined in the discussion’s on the subjects listed making everyone much more aware of other people’s concerns, ideas and solutions relating to the questions raised. This kicked off the seminar with some good food for thought right from the first instance. The next morning started with presentations on both Planit and Manager softwares interspersed with business forums and presentations on where Internetit, Planit and Manager are heading in the immediate future. Tuesday afternoon and Wednesday covered direct workshops and training on both Planit, Cabinet Vision and Manager Softwares where attendees were able to freely move between the different sessions to gain the information that suited them the most. There was information available for both new and existing customers equally. Jeff Chapman from Planit QLD (Internet IT) stated ‘the idea of this annual seminar is to provide a platform for people in the same industry to communicate with each other, have time to think and discuss ideas pertaining to their overall business objectives rather than just the software that we promote”. Attendees were able to discuss the new features and capabilities of Manager with Mike Stoodley, creator and developer of Manager software alongside existing users who also provided their feedback and practical solutions to obstacles they have encountered. The new Version 2011 of Cabinet Vision was launched with dual workshops being held for both new and existing users. This seminar also saw the introduction of two new members to the team, Garry Thoroughgood who started with Planit QLD team on the Monday of the seminar and was quickly thrown in to the deep end (and survived with good customer comments) and Elysia Hawkes who recently started with Manager Software. Elysia gave a presentation on the new Manager Software web site that she had created and impressed all with her knowledge and keenness to assist clients with their web site requirements, a new service being offered through our group. Jeff Chapman has commented that he has been extremely pleased with customer feedback following the seminar and commented on how so many customers kept talking business at various venues around Cairns in to the early hours of Wednesday morning. Keep watching for next year’s Business to Business Seminar.